Speed has been sitting by my bed for ages now, and I have finally got around to watching it. I don't think words can explain how much I love Sandra Bullock as an actress. She is just such a lovely person. It seems like just another day, but it isn't. 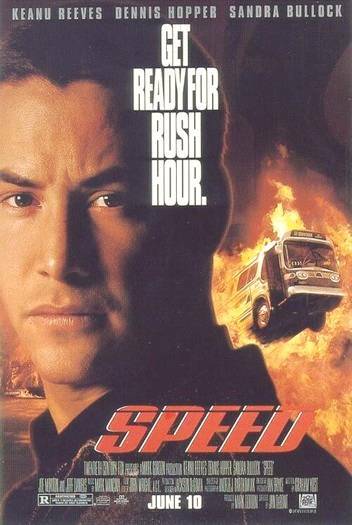 A young policeman, Jack Travens (Keanu Reeves), must save the lives of many passengers on a bus because the bus will explode if it goes under 50mph. When the bus driver gets shot, Jack must put his trust into a young woman, Annie (Sandra Bullock) to keep driving the bus until they can get out safely. This movie was so easy to enjoy, which is amazing for me because I'm not a huge fan of adrenaline rush action movies. Nor am I a hige fan of Keanu Reeves, who is less than fabulous in this movie. But I forgot about that pretty soon, because it wouldn't matter who was in this film: it would still be bloody entertaining. I guess now I'll be pretty paranoid about going in buses. The movie just lets the viewer go with the flow, even though some of the things that are happening in it are totally unbelievable. And then there is Sandra Bullock, who is completely wholesome and easy to relate to. I can't really say much more other than I really enjoyed this movie, and could watch it any time. After watching it, I felt as high as a kite. A fantastic adrenaline rush movie. It's a great flick, made all the better by a sublime Dennis Hopper as the villain! There are a couple of moments that stretch the realms of logic (such as the bus jump) but it is just such an enjoyable film.